Research has proven that ultraviolet germicidal irradiation inactivates a variety of airborne microbes and helps prevent the airborne transmission of disease. UVC energy at 254nm is the most germicidal wavelength in the UV spectrum. When used in air disinfection applications, the germicidal 254nm wavelength penetrates the cell walls of microorganisms; hence destroying their DNA/RNA and rendering the organisms unable to replicate. Since mold, bacteria and virus micro-organisms do not pose a health risk unless present in large numbers, its therefore common to install UVC lights in numerous settings where they collect; including HVAC, medical, residential and food processing for surface treatment, to name a few. In HVAC settings, UVC is used in order to prevent the growth of the airborne molecules, which include mold and other bacterial contaminants that prefer to gather in and around standing water in cooling coils and drain pans. Many users of UVC technology enjoy a clean and fresh air smell as a direct result of keeping the cooling coils, drain pans and air space free and clear of mold and organic material buildup. The ultraviolet rays help keep the HVAC unit in a virtual “as-new” condition by continuously cleaning the coils and drain pan surfaces. Therefore, UVC helps reduce and even eliminate the need for costly manual maintenance and cleaning with harmful chemicals. UVC 254nm application entails low cost maintenance which includes annual lamp replacement to ensure adequate UVC output after 9,000 hours operation. Water conservation is an added plus by reclaiming clean condensate water for other purposes including but not limited to irrigation and gray water flushing. The removal of odors is another aspect to germicidal irradiation. The UVV light (185nm) is another wavelength in the ultraviolet spectrum that is typically used to control odors and improve Indoor Air Quality (IAQ). 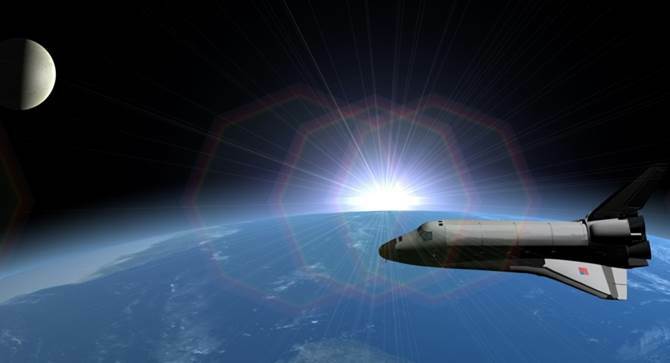 At the 185nm wavelength, the UVV light actually generates ozone (O3). This happens when this UVV light reacts with oxygen molecules, converting them into highly unstable atoms that, in turn, form O3. 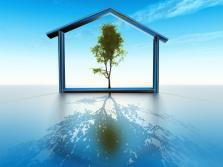 Ozone works by converting many airborne pollutants into benign, odor-free by-products. This chemical reaction can be used to disinfect and deodorize nearly any environment. H2S-based odors emanating from wastewater treatment plants and lift stations provide an extreme nuisance for residential homeowners and other institutions in close proximity. By introducing UV treatment, the odors are neutralized and the quality of life in the immediate and surrounding areas vastly improves. Can Ultraviolet Germicidal Lamps be used for water disinfection in Aquaculture? Yes, the use of ultraviolet water disinfection systems in fish farms, mussel farms, aquariums and hatcheries has lead to the production of healthier and larger fish, improved water quality, possible increases in stock density and vastly reduces the risk of disease. Does UVC germicidal light produce any dangerous byproducts in treated water? No, UVC germicidal light does not alter the chemistry of the water, nor does it alter the pH, odor or color of the water. It only destroys single cell microorganisms within the water. At the 254 nm wavelength UVC germicidal light penetrates the cell wall of the microorganism. The UVC energy permanently alters the DNA structure of the microorganism in a process called thymine dimerization. This inactivates the microorganism and renders it unable to reproduce or infect. Can UVC lamps (254nm) destroy residual Ozone (185nm)? Ozone is often used in a fish hatchery to enhance the quality of problematic water sources used for incubating and rearing fish. However, residual ozone in the water can be extremely toxic or fatal to the aquatic life being reared. Applying 254nm UVC germicidal light systems will consume the residual ozone in the bulk water prior to contacting the fish. The 254nm UVC energy breaks apart the ozone molecule; with one of the by-products being oxygen, a benefit to the fish. How does Ultraviolet Germicidal Light benefit Horticulture Applications? UVC light rays will not affect the ph or chemistry of the water applied to the Rhizosphere, and unlike H2O2 it will not have an adverse affect on organic additives or be carried over and affect germination or seedling development. Several of the species that inhabit the Rhizosphere now demonstrate multiple resistivity’s against antibiotics. These include Enterobacter, Pseudomonas, Ralstonia and Staphylococcus. None of these species can or is able to develop resistance to UVC germicidal light. What applications in Aquaculture can Ultraviolet Germicidal Lamps be used? Fish Farms, Hatcheries, Aquariums, Zoo’s, and Aquatic Laboratories all benefit from the use of the UVC Germicidal Lamp’s ability to kill microorganism’s and stop the spread of disease without the use of harsh and hazardous chemicals. Low Pressure UVC Amalgam Technology Better Than Medium Pressure UVA Technology for Curing UV Inks? For many years, only medium or high pressure UVA (365nm) curing was available to cure free radical UV inks. In the last few years, however, low pressure UVC (254nm) curing has been increasingly used to cure “cationic” based UV inks, coatings, lacquers, and resins. Since low pressure lamps can operate with much less power than medium or high pressure lamps, they are perfect for applications that require dimming [40%, 60% or 80% of full power]. Both low pressure mercury lamps and amalgam lamps produce UVC (254nm); however, there is a growing trend for using amalgam lamps due to their speed and efficiency in the drying of cationic based UV inks, coatings and resins. Before amalgam lamps, low pressure UV curing lamps produced outputs only up to 150 watts. Using more current would cause the lamp to overheat, lose mercury vapor pressure and the result was a severe drop-off in output. An amalgam lamp can produce an output of 200 to 1000 watts, one-third of which is usable UVC (254nm) energy. Amalgam lamps offer the ability to downsize the system while maintaining maximum speed and efficiency for UV curing. Of course, low pressure amalgam lamp UVC (254nm) curing is not the best technology for every UV ink curing application. But, if your application performance properties match up with the chart criteria below, then it is right for you! Moreover, low pressure UVC (254nm) curing systems produce no hazardous byproducts and have a lower operating cost than free radical UVA (365nm) curing and heat-based curing systems. Germicidal UVC lamps can be manufactured with one of two different types of glass — Quartz Glass or Soft Glass. Germicidal soft glass is a highly refined and pure type of soda lime glass, similar to that which is used to make visible light fluorescent lamps. Quartz germicidal glass is made from silica phosphate, and as such, is much, much harder in tensile strength than soft glass. Transmission of UVC is approximately 9% lower than that of quartz lamps, leading to less initial UVC output. Soft glass will not allow the transmission of UVC wavelengths below 200nm and therefore can not be used to produce ozone at 185nm. UVC transmission maintenance over the life of the uncoated soft glass lamp is approximately 30% worse than that of quartz germicidal UVC lamps. Considerable advances in internal glass coatings have extended the life time of soft glass lamps to 9,000hrs with 80% UVC output maintenance. Soft glass germicidal UVC lamps are limited to operating currents of less than or equal to 850mA. Transmission of UVC is approximately 9% higher than soft glass, thus leading to higher initial UVC output than comparable soft glass lamps. Quartz germicidal UVC lamps can produce both 254nm wavelength (killing wave) and 185nm wavelength (Ozone). UVC maintenance over the life of the lamp is much higher over the life of the lamps. Quartz lamps can maintain 85% of their output at 16,000hrs. Therefore, if your application requires the utmost UVC output possible, long operational life and the highest quality available then you need to specify quartz glass UVC germicidal lamps! 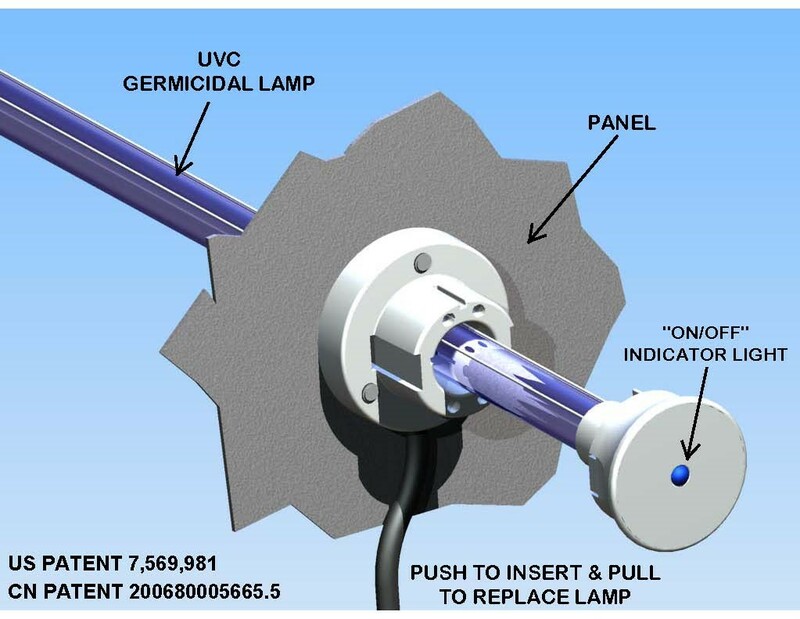 Reverse-Pin-Technology (RPT) germicidal lamps make installing air disinfection UVC germicidal lamps in the HVAC air duct in your home easy, fast, safe and effective. A simple drill and screwdriver are all the tools that a homeowner or HVAC contractor needs to bring pure air to your family, friends and loved ones. The recommended location for your RPT germicidal air disinfection lamp is either right above your air conditioning cooling A-coil (see “A” in photo below) or directly through the A-coil (see “B” in photo below). Either of these mounting locations allows for maximum coil cleaning of mold and bio-films while inactivating/disinfecting the air borne bacteria and viruses from your upstream air flow that your family breathes every hour of every day. This minimal investment of money and time (20 minutes) for the easy-to-install RPT pure air germicidal system will help prevent the common cold, flu, asthma, eye irritation, sinus congestion, skin irritation, fatigue, headaches, nausea, chicken pox, measles, bronchitis and many more unpleasant conditions. You see, UVC germicidal light, with most of the light energy focused at 254nm, is the most effective germicidal wavelength in the entire UV light spectrum. 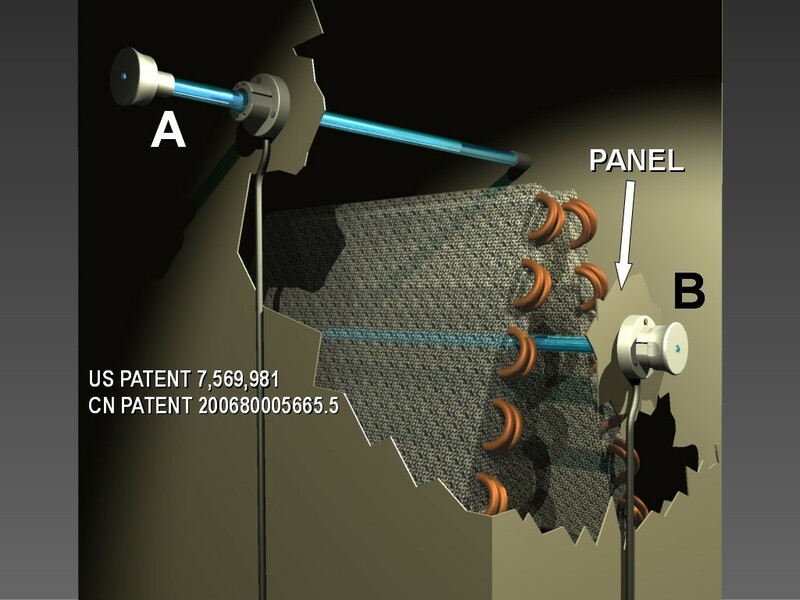 UVC germicidal light literally attacks the DNA-based airborne pollutants and mold spores by breaking their DNA molecular bonds rendering them unable to reproduce and grow.